Buying a suppressor is much easier than you may think. Just follow the steps below or give us a call and we will be happy to walk you through the entire process. What paperwork will I need to legally register a suppressor? It will cost approximately $100 more to buy using the trust method, but it will save a ton of time and provide a great deal more flexibility than an individually registered suppressor. There are many advantages to using a trust for registering a suppressor. Officer to sign off on the purchase. These benefits will save a lot of time and hassle down the road. There are many places you can go online or locally to download a Trust to be used for registering your suppressor. They range in price from $99 – $129. This is a less expensive method for registering your suppressor since you will not have to pay the $100 for a trust to be set up. However, you will be the sole owner of the suppressor and will have to be present any time the suppressor is being used (this includes your spouse and kids). In addition you will have to complete several additional steps (Steps 3 – 6 above) that you do not have to complete if you opt to register your suppressor using a trust. Purchase your suppressor at our store and choose the local pickup option. Bring your completed Form 4, Trust and $200 ATF payment in check or money order to TEXAS SHOOTERS SUPPLY for review. Once your approved Form 4 Tax Stamp comes back we will contact you to pick up your suppressor! Locate a Class III dealer in your area. Purchase your suppressor at our store. Please have your dealer email us a copy of their FFL and SOT to Texas Shooter’s SupplyOPS@hotmail.com. We will update your order and let you know once we have the information. Once our transfer forms are in place with your dealer, usually 2 weeks, we will email you the Form 4 information you will need to complete. You can complete this information and submit it right away. Please check with your local transfer dealer for their policy and procedures. We will transfer the suppressor to your local dealer and they will contact you once your Form 4 has been approved. Am I eligible to own a suppressor? If you are 21 years old or older AND able to legally posses a firearm then you should be eligible to purchase a suppressor. This also assumes you have verified it is legal to own in your State and County. Is it legal to own a suppressor in my State? Suppressor ownership and hunting with a suppressor is legal in most States. 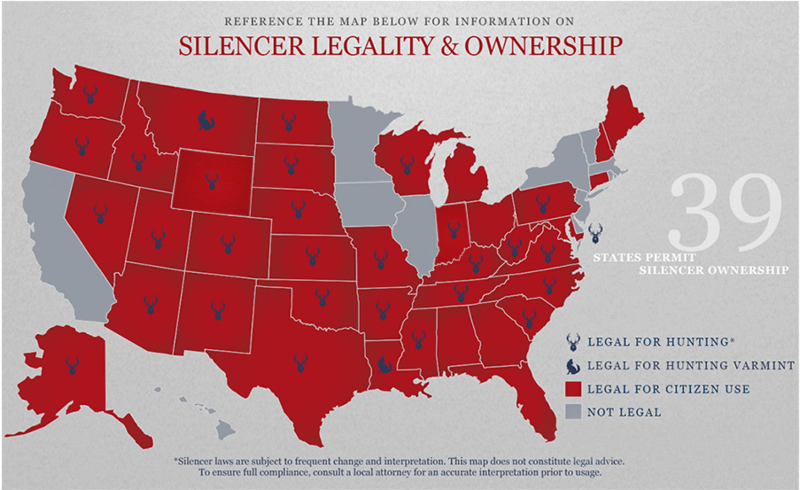 Please reference the map, provided by the American Suppressor Association, below to see if suppressors are legal in your State. This map is for reference and you should be sure to check your State and County laws before making any suppressor purchase. Wait times will vary throughout the year but can be anywhere from 3-6 months. Once you submit your paperwork you will be able to contact the ATF to inquire about the status of your paperwork. Just keep in mind this is a government process that is out of all of our control and you will need to be patient. As they have told us in the past, “It will be ready when it is ready”. fill free to contact with us.